Workout getting to hard on your old body? Exercising in water has tons of benefits. 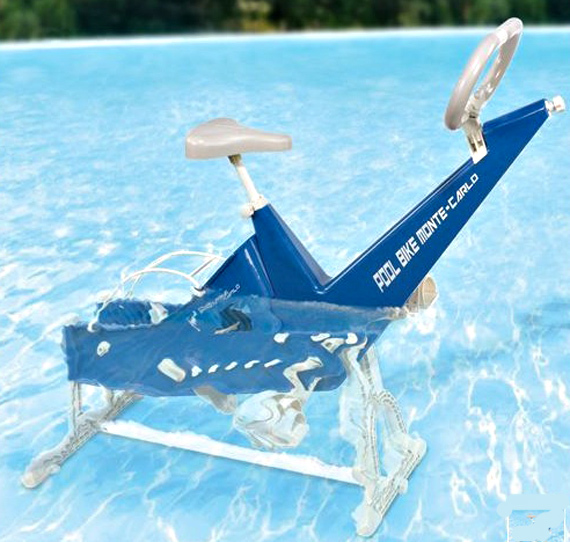 The In Pool Exercise Bike is ridden while partially submerged in a pool, which improves strength and endurance with less strain on one’s body. Used in training by professional bicyclists, riders turn a paddle that provides greater resistance than biking on land, resulting in a slow, controlled motion that improves muscle strength and endurance. The pool bicycle rests in as little as two feet of water, thought submerging it deeper increases the intensity of workouts. It features a waterproof LCD monitor that displays time, speed, distance, and calories burned. Constructed entirely of durable nylon, ABS, and fiberglass, the device will not rust and resists salt water exposure.